Grand County discharges approximately 315,000 acre-feet annually into the Colorado River and 108,000 acre-feet into the Green River, for a total of 423,000 acre-feet. Total irrigated land in Grand County is 3,859 acres, which consumes 19,808 acre-feet annually. The regional evaporation rate is about 57 inches per year. The documents below include such water related topics as groundwater, surface water, precipitation, sediment transport, flooding and climate change. 1960 - A Primer on Water by Walter Langbein and Luna Leopold. 2007 - Colorado River Basin Water Management: Evaluating and Adjusting to Hydroclimatic Variability. National Research Council. National Academy of Sciences. 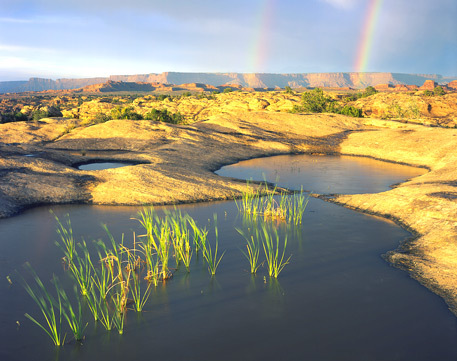 2007 - Warming may create substantial water supply shortages in the Colorado River basin. McCabe and Wolock. Geophysical Research Letters. 2008 - Stationarity Is Dead: Whither Water Management. Milly et al. Science. Death of stationarity presentation by Stephen Gray. 2008 - Climate Change in Colorado: A Synthesis to Support Water Resources Management and Adaption. University of Colorado at Boulder. 2009 - Irreversible climate change due to carbon dioxide emissions. Solomon et al. 2007 - Past Peak Water in the Southwest. Hoerling & Eischeid. Southwest Hydrology. 2009 - Utah outlook on climate change. Steenburgh. 2009 - Sustainable water deliveries from the Colorado River in a changing climate. Barnett & Pierce. The "Dealing With Drought: Adapting to a Changing Climate" Workshops: A Report for the Colorado Water Conservation Board. University of Colorado/NOAA. 1971 - Geology and water resources of the Spanish Valley area, Grand and San Juan Counties, Utah. US Geological Survey. Sumsion. 1977 - A digital model of ground-water flow in Spanish Valley, Grand and San Juan Counties, Utah. US Geological Survey. Eychaner. 1990 - Ground-water conditions in the Grand County area, Utah, with emphasis on the Mill Creek-Spanish Valley area. US Geological Survey. Blanchard. 1991 - Geohydrology of Mesozoic rocks in the upper Colorado River basin in Arizona, Colorado, New Mexico, Utah and Wyoming, excluding the San Juan basin. US Geological Survey. Freethey et al. 1997 - Map of recharge areas for the Glen Canyon and valley-fill aquifers, Spanish Valley area, Grand and San Juan Counties, Utah. US Geological Survey. Steiger et al. 1999 - A summary of the ground-water resources and geohydrology of Grand County, Utah. Utah Geological Survey. Eisinger et al. 2000 - Geohydrology and numerical simulation of ground-water flow in the central Virgin River basin of Iron and Washington Counties, Utah. (aquifers in Navajo Sandstone). US Geological Survey. Heilweil et al. 2001 - Reconnaissance study of age and recharge temperature of groundwater near Moab, Utah. University of Utah. Kip Solomon. 2007 - The Hydrolgeology of Moab-Spanish Valley, Grand and San Juan Counties,Utah, with emphasis on maps for water-resource management and land-use planning. Utah Geological Survey. Lowe et al. Plates 1-12. 1946 - Cloudburst floods in Utah. Woolley. US Geological Survey. 1963 - Flooding in Moab and Spanish Valley. Taylor. 2001 - Floods and riparian vegetation on the San Juan River. Webb et al. US Geological Survey. 2004 - Initial-Phase Investigation of Multi-Dimensional Streamflow Simulations in the Colorado River, Moab Valley, Grand County, Utah. Terry A. Kenney. US Geological Survey. 2005 - Paleofloods near Moab, Utah. Dohrenwend and Greenbaum. 1976 - Long-term surface-water supply and streamflow trends in the upper Colorado River basin. Stockton and Jacoby. National Science Foundation. 1988 - Hydrologic determination of the Upper Basin. Bureau of Reclamation. 1991 - Sediment Transport in the Colorado River Basin. National Research Council. 1997 - Colorado River Basin Study. Pontius. Western Water Policy Review Advisory Commission. 2007 - Medieval Drought in the Upper Colorado River Basin. Meko et al. American Geophysical Union. 2009 - Persistent Positive Atlantic Oscillation during Medieval Climate. Trouet et al. 2009 - Water supply risk on the Colorado River: Can management mitigate? Rajagopalan et al. Sole Source Protection Planning. DWQ.